There are lifeguards who don’t go around without a shirt as much as UB Bulls center James O’Hagan. If NCAA rules didn’t require a uniform, he’d probably try to play the game without a shirt and his #77 drawn on his chest and back. With eye black. The above picture was classic O’Hagan. Following a game where the Bulls ran for 358 yards and 6 TD, the offensive line was asked to provide a representative for the postgame news conference. O’Hagan, a team captain and star center, was the obvious choice. But getting him to “dress up” for the event was not as easy. Comb the stringy, long blond hair? No way. Take off the gameday eye black? Absolutely not. Put on a shirt? No, but a winter coat was a compromise. “My fellow offensive lineman were trying to clean me up a bit. But O-Line’s dirty. I feel dirty right now,” O’Hagan explained, with a smile on his face the whole time. Wearing a shirt, or not wearing one, doesn’t take away from what O’Hagan has done to help the Bulls to the best start in school history. A four year starter, he hasn’t allowed a sack since his freshman year. He is regularly the top graded college football center according to Pro Football Focus. O’Hagan is an NFL prospect. He has been a captain for two years. But more than that, he is the heart and soul of the Bulls team. Bulls Coach Lance Leipold welcomes O’Hagan’s personality because of what he brings as a leader. “You’ve got to try and let some personality come out. You’ve got to love the game, but you’ve got to let some personality come out along the way. James has given so much to this program. I’m happy for guys like him. If we were not in this position, he’d still be an awful special young man for what he’s done here. It’s great that everyone gets a chance to see a little of it,” says Leipold. Leipold learned all about his center the first time he met O’Hagan, after Leipold took the job in late 2014. This past week, it was O’Hagan who enhanced a message from Leipold in a team meeting. “Making sure we don’t lose focus on the process of daily improvement,” said O’Hagan, “That’s the biggest thing. We have to take it day by day and not worry about big picture stuff. One of my favorite quotes is ‘See a little, see a lot. See a lot, see nothing.’ Focus on the small stuff. You don’t see a championship, you just worry about who you have to play,” said the senior from Long Island. “A lot of times last year you saw us lose close games. This year, the biggest difference is we’re finishing games. We’re finding a way to win those tight games. Two hours before the Bulls game against Miami on October 30, the team surrounds the UB logo as part of their pregame custom. The only player without a shirt? Center James O’Hagan. The Bulls can clinch the MAC East division title with a win on Wednesday night against their rivals, Ohio. The early forecast calls for temperatures in the 20’s for the 7pm kickoff. That shouldn’t have any impact on whether O’Hagan packs a shirt for the game. O’Hagan was there in 2016, when a rebuilding Bulls went 2-10. 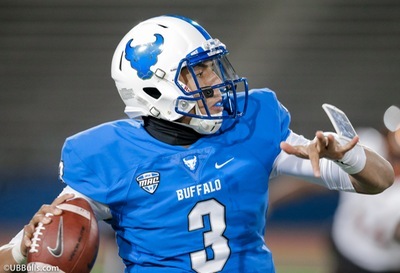 Now, he and UB are on the brink of a winning a division title, competing for a MAC Championship and playing in a bowl game. Good news for James. The MAC Championship game is indoors in Detroit’s Ford Field. The bowl game could be at a warm weather site.